Marketing in the app space is a time-consuming and complicated process. We know your time is valuable and best spent making the greatest product you can. That’s why we’re here ‒ our professional marketers have been focused on the mobile medium since cell phones couldn’t fit in your pocket. Whether you want to reach consumers or developers, we can help you achieve your goals. Before your app goes to market you need to not only make sure its ready for prime time, but also know what your competition is doing in order to keep the competitive edge. Advertising can be a great way to boost your position in the app ranking charts, but knowing where, when and how to create ads can be overwhelming. Our professionals have over 20 years of combined advertising experience in one of the world’s newest marketing fields. The chance to win something can drive brand awareness for your app – getting it in front of new eyes… and new wallets. Appency has the experience, resources and contacts to help you navigate the legal waters to create new sweepstakes and contests that pop. Getting new users is only one part of the puzzle. Once you get downloads, how are you going to get users to keep coming back to your app? Appency works with clients to implement engagement tactics such as push-notifications, email marketing and in-app-messaging to help keep users coming back for more. If a picture is worth a thousand words, a video is worth a thousand pictures. Our professional video studio creates high quality app trailers and newscast style demos. Our state of the art techniques will show your app in its best light. It doesn’t matter if your budget is large or small; where it goes – and the results it generates – are important to you… and to us as well. As smartphones become the standard for communication the world over, it becomes vital to speak to your consumers in ways they know and trust. Appency’s localization experts bring in native speakers in each language to translate your marketing materials, app description, search terms and even the apps themselves. At Appency, we understand the importance of delivering a cohesive brand message, regardless of medium. Our in-house creative design and marketing communications professionals will design and produce engaging materials to support your app’s integrated communications programs. There are over 800,000 apps in iTunes today (and just as many in Google Play) to compete with. 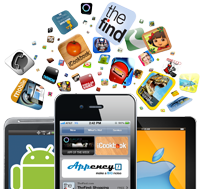 Appency understands how the app store search engines work, how it related to traditional SEO, and will optimize your application to appear when customers are searching.